It’s our first issue of 2014 – and it’s also our big re-launch edition under new owners Real Response Media. And we have pulled out all the stops to produce an ocean-covering, eye-catching, multi-faceted, must-read edition that should appeal to readers far and wide. With each of our sections fully delineated and newly re-designed, it is a much sharper, brighter and more focused look at the cruise world, in all its guises, than ever before. And we have new features, columnists and photography to make it a truly captivating selection. 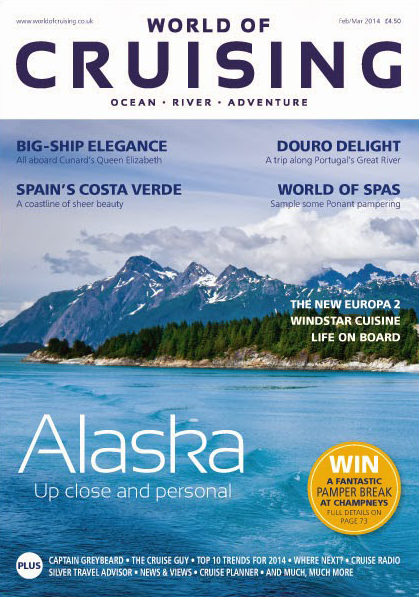 We start with our Cover Story on small-ship cruising in Alaska with Un-Cruise Adventures – the small-scale look at the Big Country – and also feature the classic style of Cunard aboard the Queen Elizabeth and the recently-launched six-star Europa 2 of Hapag-Lloyd Cruises. We sample the fabulous cuisine of Windstar Cruises and take a unique river-voyage on the Douro in Portugal with Titan Travel. In our Adventure Cruise section, specialist writer Steve Newman takes us to Norway and, just to warm up, we have trips to the Caribbean, Canaries and Florida. In fact, destinations are a new key facet of what we offer, and you will see a lot of prominence of the Where in cruising, as well as the How. Of course, alongside the new, there is also the familiar, like our essential World of Spas section, and columnists like Captain Greybeard, Cruise Radio and Cruise Guy to go with newcomers like Andy Harmer (the Director of CLIA UK) and Silver Travel Advisor. And we also include our annual Cruise Planner, the must-have catalogue of all the cruise lines and all their ships.